All international students who are on the F-1 student visa or the J-1 exchange visa are required to attend International Orientation before starting classes at MSU Denver. Even if you have been in the U.S. at another institution, you are still required to complete the International Orientation before the semester begins. Details about registration, what to expect, and what will be discussed can be found below. International Orientation is a requirement for all F-1 and J-1 international students and exchange students. It is a mandatory requirement for international students here at MSU Denver. International Student Support hosts this event, but will have different members of the campus come talk to you about some of the services provided on-campus that may benefit you. Topics such as immigration requirements, enrollment, and campus resources will be discussed. International Orientation is different from New Student Orientation, Transfer Student Orientation, or any of the other university orientations. It is specifically designed to inform you of the important regulations you must follow as an international student at Metro. Do I need to attend International Orientation? International Orientation is a special information session just for F-1 international students and J-1 exchange students. If you are currently on this visa type and this will be your first semester at MSU Denver, you are required to complete International Orientation. If you are a transfer student from another school in the U.S., you still are required to complete International Orientation here at MSU Denver. If you are not on the F-1 or J-1 visa categories, you probably will not need to attend this session. Not sure if you are required to attend? Contact ISS with questions! What should I do before International Orientation? Before you attend International Orientation, you should schedule a time to meet with International Student Support to officially "check-in" with your immigration documents. You can schedule an appointment by contacting International Student Support at intlsupport@msudenver.edu. The "check-in" is separate from International Orientation. Both are required. F-1 International Students are also required to attend MSU Denver Orientation. For your convenience, both MSU Denver Orientation and International Orientation are offered on the same dates. Registering for one does not automatically register you for the other. Please register for the MSU Denver Orientation session that best fits your student type: https://msudenver.edu/nso/sessionoverview/. Plan to be on-campus a full day if you choose to attend both orientations within the same day. When is International Orientation? How long is it? International Orientation is offered before classes begin each Fall and Spring semester. Typically, Fall orientations are offered a few days before classes begin in August; Spring orientations are offered a few days before classes begin in January. International Orientation lasts for approximately 3-4 hours. Food will be provided to you, but it is smart to bring a water bottle or snacks if you expect to get hungry. Thursday, January 3, 2019 @ 12:00 p.m. - 02:30 p.m.
Tuesday, January 8, 2019 @ 09:00 a.m. - 11:30 a.m.
Saturday, January 12, 2019 @ 01:30 p.m. - 04:00 p.m.
Friday, January 18, 2019 @ 01:30 p.m. - 04:00 p.m.
Summer international orientation is offered on an individual basis due to the small number of new students starting in the Summer term. It typically only lasts 1 hour due to the abbreviated amount of information provided. Where will International Orientation be held? Where should I park if I drive? International Orientation will be held on-campus. Typically, we hold it in the Student Success Building or at the Tivoli. More information about the specific location for your International Orientation will be provided when you register. For students who will be driving, the nearest parking garage is the Tivoli Garage ($2 per hour, or $6.50 for the entire day). 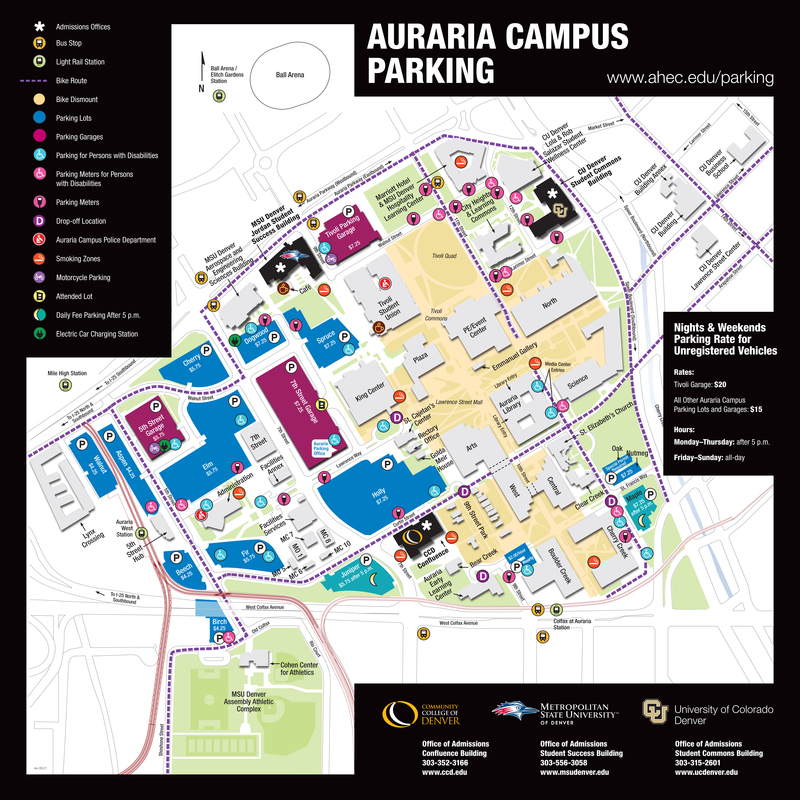 For other parking lot and garage locations, please refer to the Auraria Campus Parking Map. Additional metered street parking is available next to the Tivoli. The Spruce parking lot is also close to the Tivoli and the Student Success Building, which offers a daily lot fee that you can pay with cash, credit/debit card, or by using your phone. Review some of the other parking lots, garages, and parking options before you come to campus! How do I register for International Orientation? Registration for Fall 2018 International Orientation is simple! Just fill out the Fall 2018 International Orientation RSVP form. If you have other questions about International Orientation, please contact International Student Support.